That’s right, the 60’s pedal looked like some alien spaceship and was made famous by the great Jimi Hendrix! That red (or black or gray or blue) flying saucer made some of thegreatest classic rock tones in the minds of the guitar players, I mean, us. Maybe the guy even came to Earth inside that thing, who knows? And of course the name BOG comes from Band Of Gypsys; for me his tone started to change by the time Electric Ladyland was recorded and later on we hear the epitome of Jimi’s tone: clear, full, articulate, big, crushing, dynamic… He seemed to finally have it all there! So here is my tribute. The idea here is not to reproduce only Band of Gypsys tones, but to get the vintage soul of the classic FF, yeah, the big round box he loved so much, with a “hi-fi” touch. But if you’ve ever read Roger Mayer interviews on books about Jimi’s sound, and I’ve read many, you know that going conservative on the Arbiter factory schematic and specs isn’t the smartest move. Mr. Mayer claims he made a lot of improvements and modifications to the boxes, sometimes even adding more gain/clipping stages both before and after the main fuzz circuit. He also says he started messing with silicon transistors around 1968 because of lower noise and higher stability (’68 = Electric Ladyland, see how we’re going somewhere here? ); and that the FF circuit wasn’t the only thing inside Jimi’s fuzz boxes, especially later on his career. To me, that means the conservative approach is a no-no (and that goes along with the whole Deep Trip concept of going for tones, rather than factory drawings). So I took some months with all my favorites (vintage originals, boutique versions, clones, replicas, reissues and work-alikes), together with all my old Deep Trip pedals and prototypes, to extract, compare and match the attack, voicing and decay for my ultimate favorite version of that famous circuit, always listening to the man, and then I did it my way (that means no compromises). Last but not least, it got all the Deep Trip goodies it could: correct impedance input and output stages (to work with wahs, buffers, any pedals, any amps), external bias control, external bass and treble content controls… so you have a modified FF vintage soul in the core, much more control all around and none of the vintage issues, how do you like that? And OH, my added “hi-fi” approach to the circuit brought a heavy and firm bottom end that’s so hard to hear in any fuzz box, it sounds gorgeous! Jimi would love this, he loved nice bottoms, you know… Some say the BOG isn’t exactly a fuzz pedal, but rather a fuzz/overdrive/distortion/whatever you need. It does a lot of different sounds and goes way beyond the typical Fuzz Face/Jimi Hendrix coverage, trust me. The LOWS control allows you to shape the bass content and go from thick and fuzzier to tight and sharper attack, and anything in between. It actually changes the peak frequency of the effect, so you can look for sweet spots all around its range. Those that find fuzz faces too flabby will love the tighter settings, they work great with neck pickups and rhythm playing, or whenever you need the mud out of your way. Full counter-clockwise is fat, mushy and fuzzy attack, rolling it forward adds some low end definition (and easier guitar volume clean up), full clockwise is sharp and cutting through the purple haze (your picking comes out nice and bright). Try tighter settings with some nice humbucker pickups, you don’t have to stick to your strat this time! The HIGHS control, on the other side, works on the top end and lets you travel from smooth and round all the way to aggressive and bright. The first great impression is that lower settings send you back to germanium sixties versions (the NKT275 ones), while higher will get you closer to the classic silicon territory (the BC108 stuff). Second important usage is compensating for amps and speakers different responses and interactions. Smoother side works great on clean amps, while brighter sits well on already saturated sets. You may also want more high-end aggression on bassier sets and rounder fuzz if you already have lots of sparks going on. So you’re free to try different amps and speakers for a huge variety of options, just like an experienced chef would experiment with that old strat>FF>Marshall>Celestion recipe. Hmmm, are you…? Then we have an external transistor BIAS control, much like our old MOOD knob. A lot of people seem to be putting these controls on fuzz boxes nowadays (back in 2007, when DeepTrip started, it wasn’t so popular), but they all mess with the volume, so it’s hard to change bias settings between songs, for example. Our new BIAS control is completely independent from output amplitude, so you can walk all around without having to reset your volume. Nice, huh? Typical voltage is close to the middle, where you have more symmetrical clipping, take it as a “standard” position and explore from there. Use slightly higher settings to raise headroom and asymmetry, for even better guitar volume clean up and more defined pick attack, upper extreme is so asymmetrical you can even get an upper octave there! Slightly lower settings (from the middle) bring compression and more mushiness and softness to the attack, lower extreme brings a “gate” effect in, like a battery almost dead (lower your guitar volume for even heavier gating). Have some fun all around those! For VOLUME, the old ones usually need to be close to maximum match bypassed level. Not here: we like our pedals to have enough volume to let you get some tube amp overdrive if you want, so you can match bypassed volume with FUZZ maxed way before 12 o’clock; from there all the way to max, you have more gas to saturate what comes next in your chain and add further shades of clipping to your fuzz. Try it with your tube amp, should sound nice! Like I said up there, Roger Mayer claims that they did a lot of different pre and post gain stages for Jimi’s fuzz boxes in the studio, so mixing some tube amp clipping may be a good way to go to get some magic. 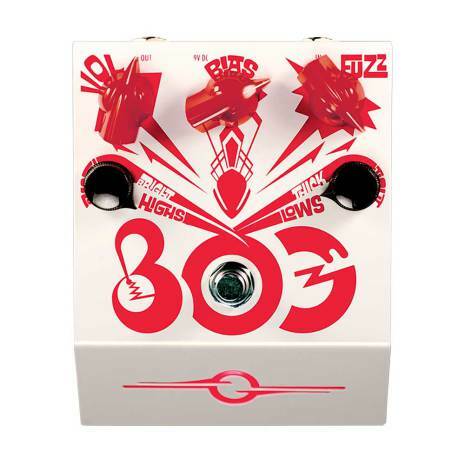 Although the core of the BOG is a modified Fuzz Face circuit, here we don’t like to stop where everyone does. So, like all Deep Trip pedals, the BOG takes the usual 9V, center negative power supply, as most standard pedals do. No hassles here, no exclusive power supply, no polarity inversion needed, plain simple. It is also completely immune to temperature changes and any input impedance issues, it works great with a wah-wah (~I’m a voo-doo chi-iiild~) and can be put anywhere in your pedal chain, even after buffers, unlike the old ones and the replicas that have to come first always. If that’s not enough for you, we’ve also worked on output impedance to make it more friendly to lower input impedance amps; that’s the issue that makes most vintage fuzz pedals sound buzzy and weird (in a bad way) on some modern amps, that’s solved as well. Hey, and like all Deep Trip pedals, it looks cool as hell, doesn’t it? Let’s show those aliens some good mother Earth rock n’ roll!